When you are looking for a place to sell your stuff, eBay is probably the first marketplace that comes to mind. It is the largest and probably best-known marketplace in the world, but this doesn't mean it is the best choice for you. As good as eBay is, it's hard to ignore its disadvantages. It's crowded, sellers are frequently banned for little or no reason, disputes are settled in buyers' favor, and so on. All these reasons will certainly discourage potential sellers – who wants to invest their time and money in such an uncertain environment? I myself considered selling on eBay but after a preliminary research, I totally gave up the idea. Instead, I started researching for alternatives and this is what inspired this article. There are quite a lot of eBay alternatives and I recommend you try a few. As I frequently say, don't put all your eggs in one basket – i.e. you'd better sell on multiple marketplaces than focus all your resources on only one. It's up to you (and the type of your product) to choose which ones to start with. The basic rule is that the larger marketplaces attract more buyers but the smaller marketplaces could prove a better option because generally there isn't that much competition. 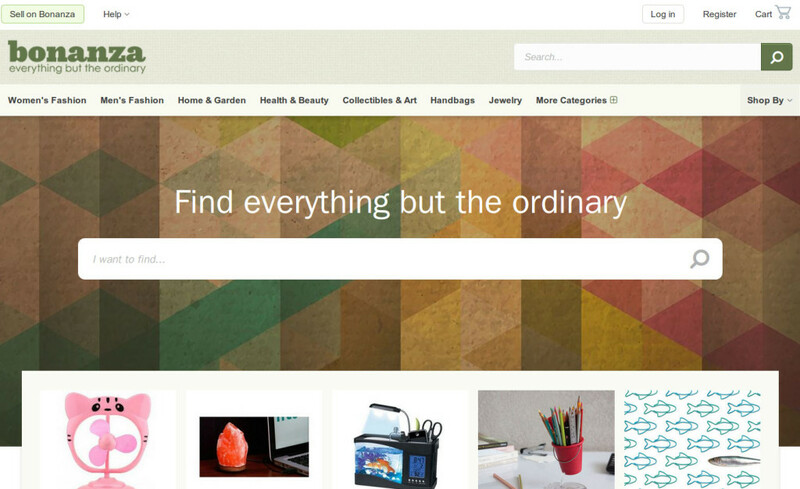 In addition to listing your products on some marketplace, setting your own online store is always an option. However, it's hardly the easiest and cheapest one. While you certainly have more control with your own site, calculate all the money and effort you have to put into setting the store up, maintaining it, and promoting it in order to make it successful and it turns out an established marketplace is a better choice, at least in the beginning. Here are some other eBay alternatives for you to consider. While many will argue Amazon it's not an eBay alternative at all because it shows some of the symptoms that push sellers away — i.e. outrageous commissions, shops closed at whim, etc. 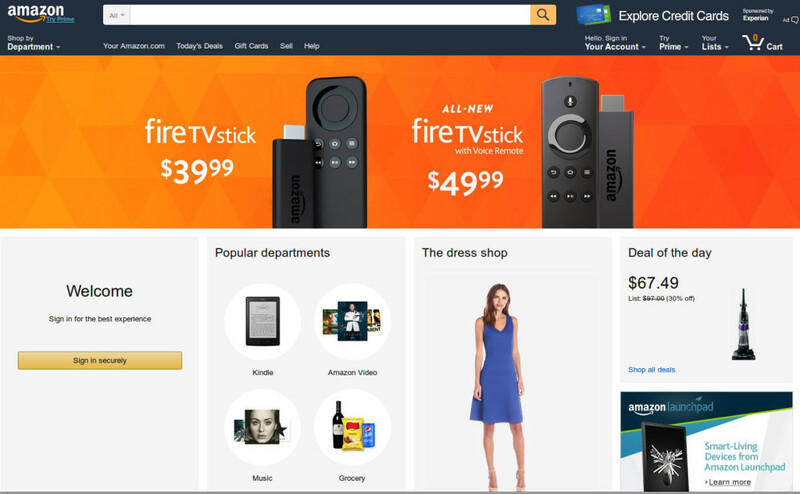 — you can't deny Amazon is a huge marketplace where you can sell almost everything you can think of (provided it's legal, of course). It's not an exaggeration to say Amazon is an institution. Don't expect to go to the site and start selling right away. There is a lot of stuff to read before you can start selling. For instance, you need to consider the type of account (Professional Seller, Vendor, Manufacturer and Distributor, etc) to open because there are a couple of them and each has different perks. self-publish. None of the other eBay alternatives on the list offer this. As for payment, shipping, and commissions, these vary depending on the product and the type of account. Here are the general rules for shipping and delivery and for payment, pricing and promotions. You might also want to check fulfillment by Amazon. In other words, if you decide to sell on Amazon, be prepared to spend days or even weeks researching how the system works. It really offers huge opportunities but it's not for beginner sellers. If you are new to online sales, you'd better start with easier places. eBid is another huge marketplace, though not as big as eBay or Amazon. It looks really promising! It's not new – it has been around since 1999 but it grew exponentially in the recent years. One of its great features is that you can import items from Amazon, eBay and other marketplaces, which coupled with its bulk upload functionality is a huge timesaver. eBid is a universal marketplace. It has more than 13,000 categories of products across all product groups – from books and tech, to clothes and household items. You can also sell wholesale. 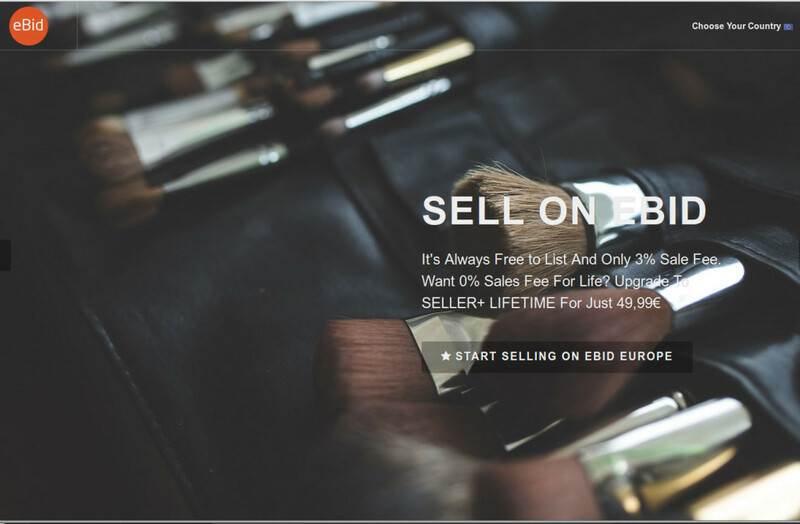 eBid offers Seller and Seller+ accounts. As for payments, they work with PPPay, PayPal, Skrill, and of course credit cards. All in all, for most products eBid is the best eBay alternative. Rakuten is another global marketplace. It's huge in Japan but it is popular in many other countries as well. In the past I made some affiliate sales for them but I have no personal experience as a seller there. 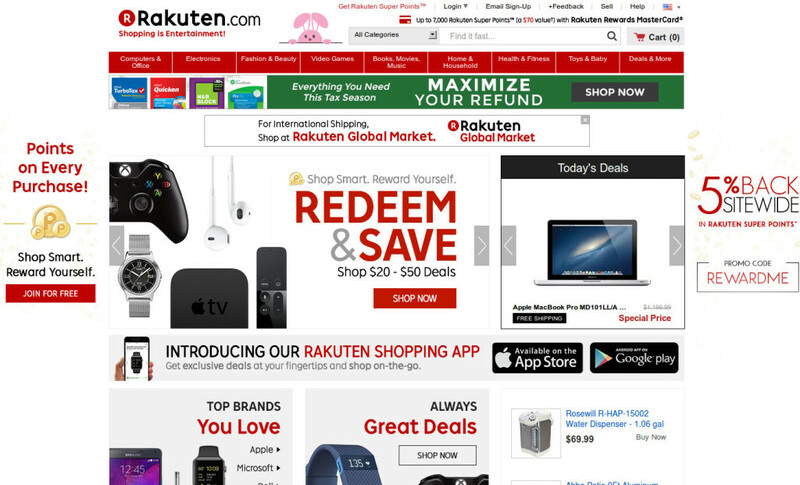 Rakuten is a universal site with goods in any category you can think of – books, personal stuff, tech, household items, etc. If you are looking for a cheap place to sell, Rakuten is not an option for you. Compared to sites where listings are free and commissions are small, Rakuten's pricing options are outrageous but if you manage to sell volumes there, it might turn out a better option than sites with no fees (and no buyers). “What are the requirements to sell? The choice of payment systems is up to you. As they state, “The majority of shops on our marketplace accept major credit cards (Visa, MasterCard, JCB, AMEX, Diners, etc), Paypal, Alipay, and bank transfers.” The same applies to shipment methods – you manage them individually, and you can use direct or indirect shipping. Based on all this, my conclusion is that Rakuten doesn't compare well to the first two eBay alternatives but still it's a big marketplace and for you it might be an option after all. 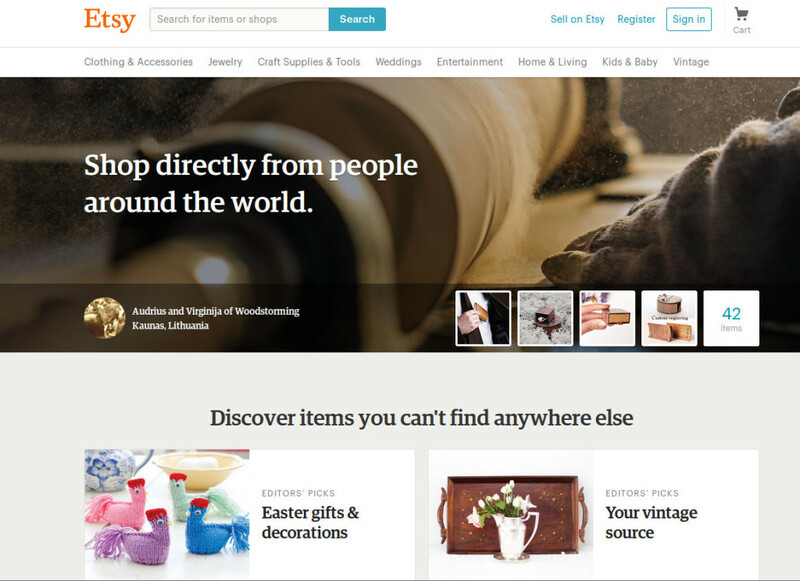 Unlike the marketplaces so far, Etsy isn't a universal marketplace. Instead, it specializes in handmade and vintage stuff. In the beginning sellers were allowed to sell only stuff they personally made, but now they can use dropshipping. This means you can sell print-on-demand stuff made at sites such as Zazzle or CafePress, too. As for product categories, as I already mentioned, Etsy isn't a universal marketplace. It has the following categories: Clothing & Accessories, Jewelry, Craft Supplies & Tools, Weddings, Entertainment, Home & Living, Kids & Baby, and Vintage. Etsy has a $0.20 listing fee. A listing is active for 4 months or till the product sells. In theory the listing fee should reduce the amount of spam because when sellers have to pay a fee, they will upload only their best stuff. Yet the fee is affordable unless you upload millions of items that don't sell. The site uses their own Direct Checkout payment system but in shops' descriptions I've seen sellers mention that they accept direct payments as well. If you go with direct payments, it's up to you to choose which payment systems to accept. With Direct Checkout you can get paid via credit and debit cards, PayPal, Google Wallet, Apple Pay, and Etsy Gift Cards. When you sell a product, you are charged a 3.5% transaction fee and 4% + USD $0.30 for payment processing if you use Direct Checkout. If you don't use Direct Checkout in most cases you still have to pay payment processing fees but these vary depending on the service you are using. Bonanza is another eBay alternative to consider. 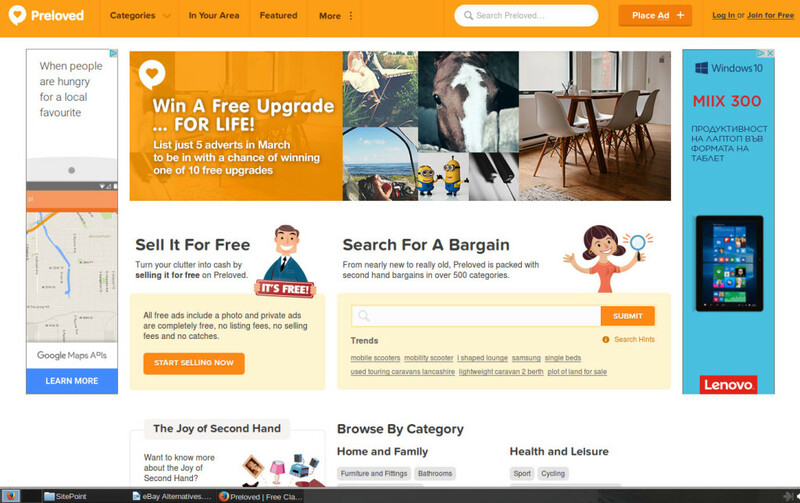 In fact, they actively market themselves as better than eBay – “Recommended over eBay 5 years running”. Bonanza doesn't have as many product categories as eBay – it's mainly fashion, home and garden, health and beauty stuff but they also have books, computers and tech and so on. This site looks promising and it is on my personal To Try list. Their fees and payments are relatively low. With 3.5% for FOV (Final Offer Value) under $500 for standard booths and $17.50 + 1.5% of the amount over $500, the fees are quite reasonable. 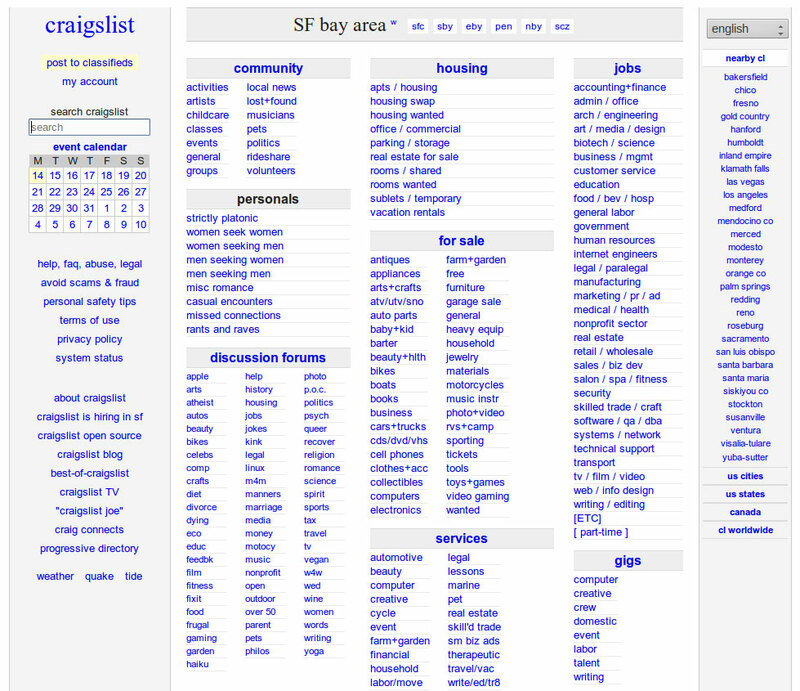 Craigslist and the other similar classified ads sites are another eBay alternative. I know sellers who sell exclusively on Craigslist and won't even hear of any other sales channel. However, this doesn't mean classified ads will work for you. Some are these sites are free, some charge per listing, or a flat (weekly/monthly) fee. In general they don't take a commission and you handle payments on your own. Last, but not least (as the cliché goes), you might want to explore local alternatives. The choices here are huge – from the local sections of Craigslist, to local sites, such as Preloved. Unfortunately I can't help much here – you need to research on your own what options are available in your particular location. Local marketplaces are generally smaller but more targeted. The benefit of reduced competition is obvious. Selling locally is a great choice for heavy and/or bulky items when delivery from another location costs a fortune. Additionally, when the buyer wants to see in person the goods before he or she buys them, selling locally beats all other options. There are many more global and universal, not to mention local and niche, marketplaces I didn't include in the article. Some of them could be a better choice for you personally but I tried to focus on the more popular alternatives. If none of the eBay alternatives listed in the article are good for you, with some research you will certainly find others. For instance, if you are in UK, this list might be particularly useful to you. Or, if you are a wholesaler, don't forget to check Alibaba as well.